You'll get there! It's like eating an elephant, one bite at a time and you'll get it done! I love the pillow idea! I have learned a great lesson...work in all the loose ends as soon as each square is edged. 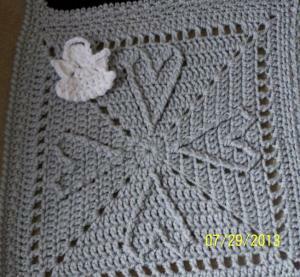 One of my great niece's afghans is assembled but I still have to work in all those loose ends. I have a pic with my son holding it up but it needs to be touched up before I can share it. 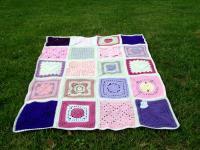 Will assemble my other great niece's ghan after I take care of the loose ends. 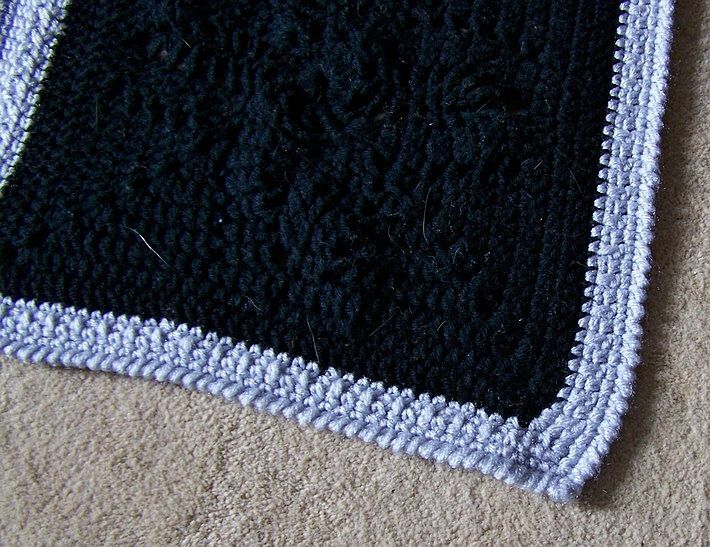 Finishing up the edging on Sean's squares; hopefully, it won't take me too long to assemble it. Best of luck! I hate weaving in ends. Thanks, Nira! I have all Sean's squares edged AND the loose ends worked in. YAY! Shouldn't take too long to join them all and then it's the outer border for which I would appreciate suggestions. The outer edge of each square is sc, sk1. Thanks! Working on all the loose ends on one of the girls' ghans now. Pics of the ghans for Caroline and Jena. Gonna try to get some clearer pics so you can see the top squares. 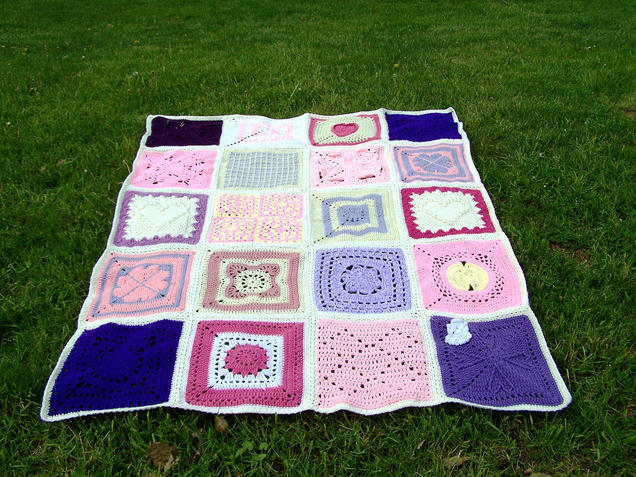 The 1st round of edging on each square was sc around with 3 sc in the corners. Then I used *sc, ch1, sk next sc, sc in next sc* with sc, ch2, sc in each corner. The edging around the whole ghan is *sc in sc, dc over ch 1 sp into sc in round below*. Location: I live in Northern Ireland. They are gorgeous, they will love them. They turned out great. The girls should love them. Thank you, Ladies! 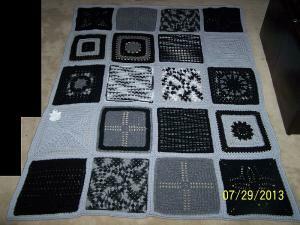 I have my nephew's ghan assembled but still need to work in some loose ends and edge the ghan. Life has been altered for us since April 23 when my husband was admitted to the hospital due to very serious problems from advanced COPD. He has been hospitalized all this time with 2 transfers to 2 different in-patient rehab facilities where he was unable to do the required rehab. Each time, he was trassferred back to the hospital. BUT, today we hope he will be moved to a skilled nursing facility which will only require 1 hour per day of rehab whereas the other 2 places required 3 hours per day. Please pray for him that this rehab will make his legs strong enough so he can stand and begin walking. Yep, he's been bed ridden all this time. He was on a ventilator for 4-5 days and he was totally immobile. But he's fighting and getting stronger every day. 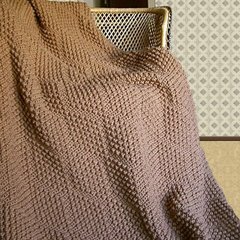 So hopefully, as he improves, I can get back to completing Sean's afghan soon. So sorry to hear about your husband. My thoughts and prayers are going out to you. The ghans came out beautiful! I'm sure the girls will treasure them. Prayers for your DH!!! Thank you both, especially for the prayers. I was looking at the borders on the girls' ghans and decided they at least need a round of sc or maybe rsc to straighten out the edges. In some places, the border tends to dip. They look great! So glad I was able to help out! 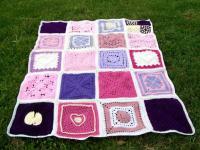 The afghans are lovely and am sure they will be treasured. Sending my prayers for both of you. Yes, Amy, you were a BIG help! Thanks for everything! And Mary, thank you so much for the prayers. Don't know if anyone is following this thread anymore and I'm sorry for never posting pics of the 3 afghans--with the borders. They are finished but in a box somewhere in my son's basement. Back at the end of April my husband was hospitalized with a severe COPD exacerbation and it was a very long 8 months before he passed on December 26. I had to move out of our townhouse at the end of January and in with my son and his fiancee for the present time. All things considered, I'm doing okay. He was the love of my life and I miss him more than I could ever say. I have wonderful memories and he still makes me laugh. 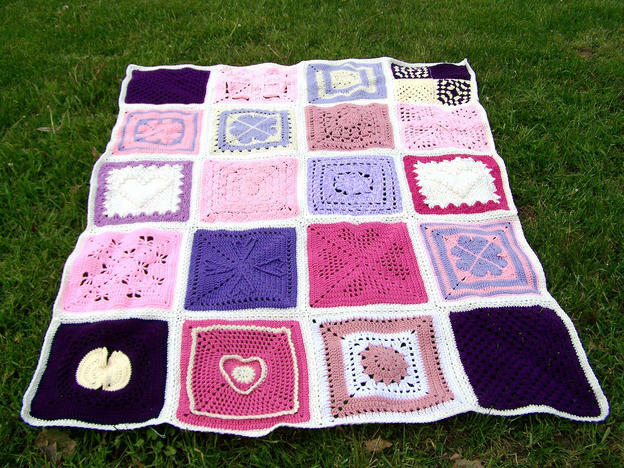 I certainly had hoped to have those afghans in my great nieces and nephew's possession by now as well as pictures of them with the finished borders for you to see. Now I have to wait for our weather to warm up so we can move some stuff outside, then hopefully I'll find that box, get pictures and put them in the mail. 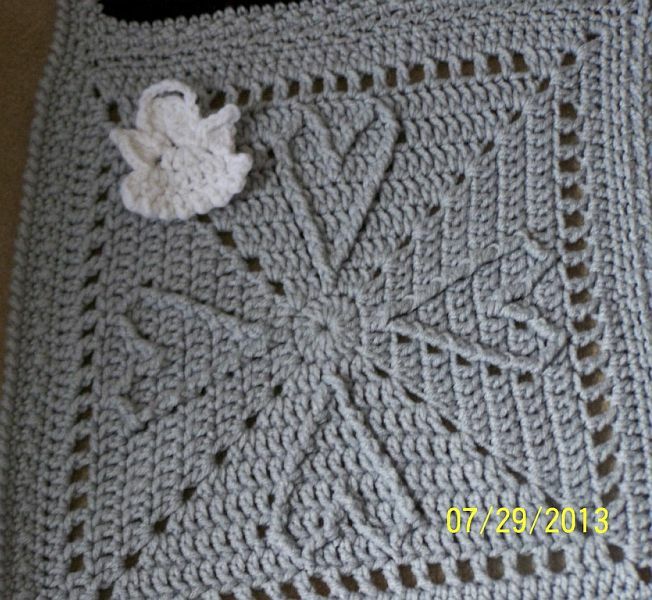 Pics of Sean's ghan (my great nephew). I hope to have pics of the girls' ghans very soon. That looks so cool. He is going to love it.